We will go through the Pitching First, and then the hitting by the weekend. A.J. Griffin would have been the ace of this staff, and I would have projected a 16 – 10 record and a low 3 ERA if he wouldn’t have come down with injury. With a strained elbow, I am leery of placing any projections on the man. At 26, he would have been entering his 3rd year in the bigs. Griffin has been a solid contributor on the last 2 AL West Title runs. He has amassed a record of 21 – 11, with a 3.60 ERA in 47 Games Starts. Beane stole this guy in the 13th Round of the 2010 MLB Amateur Entry Draft. 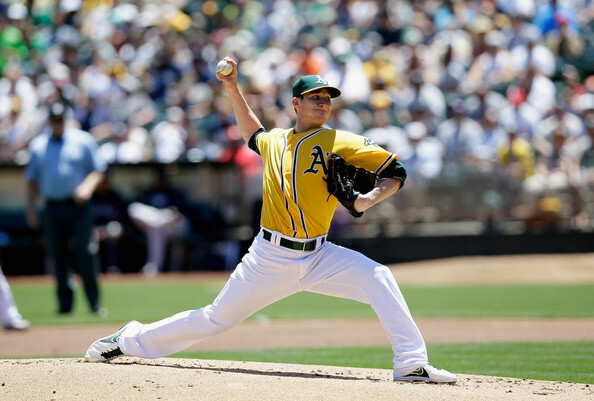 Sonny Gray (24) Drafted by the Oakland Athletics in the 1st round (18th pick) of the 2011 amateur draft. Tommy Milone (27) SP: Gio Gonzalez was traded with Robert Gilliam to Arizona for P Tommy Milone, C Derek Norris and Brad Peacock. Gio Gonzalez (30) SP: January 3, 2008: Traded by the Chicago White Sox with Fautino De Los Santos and Ryan Sweeney to the Oakland Athletics for Nick Swisher. Nick Swisher (33) 1B/OF: Drafted by the Oakland Athletics in the 1st round (16th pick) of the 2002 amateur draft. Fautino De Los Santos (28) RP; July 28, 2012: Traded by the Oakland Athletics to the Milwaukee Brewers for George Kottaras. Ryan Sweeney December 28, 2011: Traded by the Oakland Athletics with Andrew Bailey to the Boston Red Sox for Miles Head (minors), Raul Alcantara (minors) and Josh Reddick. Brad Peacock (26) RP: February 4, 2013: Traded by the Oakland Athletics with Chris Carter and Max Stassi to the Houston Astros for Jed Lowrie and Fernando Rodriguez. See the Hitters (this weekend) for Jed Lowrie and Josh Reddick breakdowns. Chris Carter (27) Is part of that mega deal listed below. Max Stassi (23) DH/C: Drafted by the Oakland Athletics in the 4th round of the 2009 amateur draft. So essentially you had Reddick, Norris, Milone and John Jaso (acquired for A.J. Cole (Minors), who with Krol and Treinen.) along with Andrew Bailey, Nick Swisher and Robert Gilliam (8th round Draft of Oakland A’s 2009 year). Swisher played poorly for the White Sox, and Bailey has never lit it up with the Red Sox either. This is one is a pretty fair deal if you ask me. Please see this trade reactor on the hitter’s side under Josh Reddick. Andrew Bailey (29) RP: Drafted by the Oakland Athletics in the 6th round of the 2006 amateur draft. Derek Norris and Josh Reddick see the hitters writeup. I am only adding the Jaso part to the below portion. George Kottaras (30) C: January 25, 2013: Selected off waivers by the Kansas City Royals from the Oakland Athletics. Tommy Milone is 25 – 20, with a 3.94 ERA for Oakland. He has been part of 2 AL West Division Winners in 2012 and 2013. John Jaso (30) C/1B/DH: January 16, 2013: Traded as part of a 3-team trade by the Seattle Mariners to the Oakland Athletics. The Oakland Athletics sent a player to be named later, A.J. Cole (minors) and Blake Treinen (minors) to the Washington Nationals. The Washington Nationals sent Mike Morse to the Seattle Mariners. The Oakland Athletics sent Ian Krol (March 20, 2013) to the Washington Nationals to complete the trade. Ian Krol (22) RP: Drafted by the Oakland Athletics in the 7th round of the 2009 amateur draft. Blake Treinen (25) SP: Drafted by the Oakland Athletics in the 7th round of the 2011 MLB June Amateur Draft. This works out to be John Jaso for the 3 players (2 they drafted and one player who they picked up (Cole, in the Gonzalez deal). John Jaso has hit .260/.379/.378 for the A’s. Now Krol was used as part of a trade to acquire Doug Fister from Detroit – after a 3.95 ERA in the District Last Year. A.J. Cole is still in the Minors, whereas Blake Treinen is in the Bullpen for the start of the 2014 year at least. 1. Cowgill was traded with Ryan Cook and Jarrod Parker for Trevor Cahill, Craig Breslow and cash. 2. Breslow was picked off of waives by the A’s from the Minnesota Twins for no compensation. 3. Cahill was drafted by the A’s in the 2nd round of the 2006 Amateur Draft. Breslow, 33, has fared well in the Boston Relief Core – with a 2.22 ERA in 99 Appearances, covering 93.1 IP. Collin Cowgill (27) OF: December 18, 2012: Traded by the Oakland Athletics to the New York Mets for Jefry Marte (minors). Jefry Marte (23): Has been playing at AA Midland, and is starting to hit better. 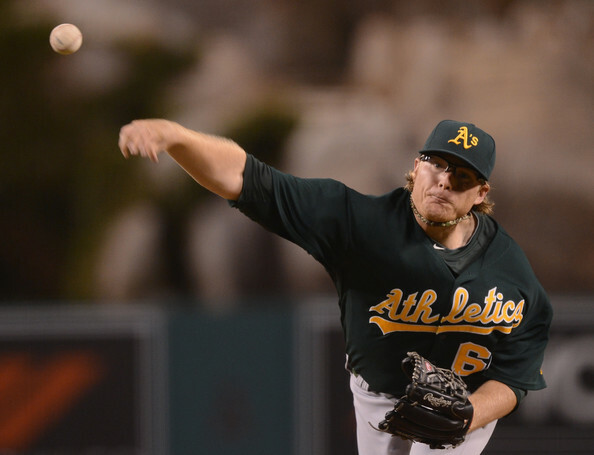 Jarrod Parker is out for the year with Tommy John Surgery, however he holds a 25 – 16 record with a 3.73 ERA thus far. Ryan Cook (26) RP: has been one of the best Relievers in the AL the last few years, carrying a 2.32 ERA – with 16 Saves in 145 Appearances – spanning 143.2 IP. Collin Cowgill only had a .654 OPS in 104 AB with Oakland before his trade to the Mets. Trevor Cahill (26) SP: Has been relegated to the Bullpen, after 4 starts for Arizona this season (all losses and a 9.17 ERA). He is 21 – 26 with a 4.13 ERA for the D’Backs in his time there. Cahill was by the Oakland Athletics in the 2nd round of the 2006 amateur draft. I like A’s on this transaction to date. Drew Pomeranz (25): December 10, 2013: Traded by the Colorado Rockies with Chris Jensen (minors) to the Oakland Athletics for Brett Anderson and cash. Connor Robertson (32) RP: only ever played in 6 games the rest of his career, sporting a 5.14 ERA for the Dbacks. Aaron Cunningham (28) OF : January 16, 2010: Traded by the Oakland Athletics with Scott Hairston to the San Diego Padres for Kevin Kouzmanoff and Eric Sogard. Scott Hairston (33) UT: July 5, 2009: Traded by the San Diego Padres to the Oakland Athletics for a player to be named later, Craig Italiano (minors) and Ryan Webb. The Oakland Athletics sent Sean Gallagher (July 28, 2009) to the San Diego Padres to complete the trade. Hairston never had played exceptional for the A’s, and the trend continued for the Padres too. Gallagher of course, was brought to the A’s by the Rich Harden deal explained later in this article. Ryan Webb (28) RP: Drafted by the Oakland Athletics in the 4th round of the 2004 amateur draft. He had a 3.19 ERA in 2 years of relief for the Padres. Craig Italiano (27); RP: Drafted by the Oakland Athletics in the 2nd round of the 2005 MLB June Amateur Draft. Never played in the Majors. Kevin Kouzmanoff (32) INF: August 23, 2011: Sent to the Colorado Rockies by the Oakland Athletics as part of a conditional deal. This was a weird one as Kouzmanoff has 20 HRs and 88 RBI 687 AB for the A’s. but a .666 OPS and no walks must have been troublesome for Billy Beane. At least the club still has 2B Eric Sogard left for this bevy of transactions. Dana Eveland (30) SP: Started 38 games for Oakland, featured a 4.92 ERA in 212 IP. February 7, 2010: Eveland was Purchased by the Toronto Blue Jays from the Oakland Athletics. Carlos Gonzalez November 10, 2008: Traded by the Oakland Athletics with Greg Smith and Huston Street to the Colorado Rockies for Matt Holliday. Greg Smith only pitched to a 6.23 ERA in his time with the Rockies. Now Carlos Gonzalez is a mega star in Colorado, Dan Haren was the guy used to acquire him from Arizona, and the organization still had Brett Anderson left over from the same deal. July 24, 2009: Matt Holliday was Traded by the Oakland Athletics to the St. Louis Cardinals for Clayton Mortensen, Shane Peterson and Brett Wallace. In this whole train of transactions, the A’s ended up with Drew Pomeranz, Daric Barton, Eric Sogard, Jed Lowrie, Michael Taylor and (Shane Peterson with AAA Sacramento), plus only lost Huston Street and Mark Mulder for it (and Connor Robertson-Minors), as pieces of the initial Mulder deal, (Dan Haren) was also used to acquire Carlos Gonzalez. Gonzalez was used to acquire Holliday as the main piece. Brett Wallace was the main part coming back from Holliday in the St. Louis trade, and he was later flipped for Michael Taylor from the Blue Jays. Shane Peterson (26) OF: is with Sacramento – and may be part of the team at some point. Peterson made his MLB Debut a year ago today. In his 2nd game he collected his 1st hit and RBI. Holliday was never going to sign long-term with the A’s. He has done well with the Cardinals, and it took a 7 YR deal worth $120 MIL to retain his services. Michael Taylor (28) has been suspect in his time in the Majors, holding a .399 OPS in 74 AB. The whole Michael Taylor, Anthony Gose, Brett Wallace trading hasn’t netted much for anybody. The A’s also wouldn’t have been able to afford Carlos Gonzalez going forward. Beane just keeps his tradewinds flowing. Huston Street (31) RP: was traded by the Rockies to the Padres for cash, and is a decent closer in the NL Street was pretty good in Colorado for his 3 years – with a 3.50 ERA (not bad in COL) with a 1.058 WHIP and 84 Saves. Mulder hasn’t played since 2008. Mulder went 22-18 with a 5.04 ERA for the Cardinals, while Anderson was 26-29 with a 3.81 ERA. Street was taken in the 2004 Draft as a Sandwich Round pick for losing Miguel Tejada to the Baltimore Orioles in FA. A.J. Griffin (26): Griffin was drafted in the 13th Round of the 2010 Amateur Draft. Scott Kazmir (30): December 4, 2013: Signed as a Free Agent with the Oakland Athletics. Dan Otero (29); March 27, 2013: Selected off waivers by the Oakland Athletics from the New York Yankees. Luke Gregerson (29): December 3, 2013: Traded by the San Diego Padres to the Oakland Athletics for Seth Smith. Seth Smith (31) OF/PH: January 16, 2012: Traded by the Colorado Rockies to the Oakland Athletics for Guillermo Moscoso and Josh Outman. 3. Moscaso was acquired by the A’s in 2011 for Ryan Kelly. Moscaso had one poor year in Colorado before being selected off of waivers. 4. Ryan Kelly was acquired for Corey Wimberly. 5. Corey Wimberly was traded for Matt Murton. 6. Murton came over with Josh Donaldson, Sean Gallagher and Eric Patterson from the Cubs for Chad Gaudin and Rich Harden (Drafted in the 17th RD of the 2000 Draft. 8. Gallagher was sent to the Padres for Scott Hairston Jr., who was traded back to San Diego for Kouzmanoff and Sogard. 9. Patterson was traded to the Boston Red Sox for Fabian Williamson. Williamson was later claimed by the Rangers off of waivers. So basically Gregerson and Josh Donaldson is all the club has left out of Joe Blanton, Rich Harden and Dustin Majewski. Still Harden and Blanton are retired now – and Majewski never made the Majors. Fernando Abad (28): November 25, 2013: Traded by the Washington Nationals to the Oakland Athletics for John Wooten (minors). John Wooten (23) 1B: Drafted by the San Diego Padres in the 20th round of the 2009 MLB June Amateur Draft from Eastern Wayne HS (Goldsboro, NC) and the Oakland Athletics in the 37th round of the 2012 MLB June Amateur Draft from East Carolina University (Greenville, NC). Ryan Cook (25): Again look to the Jarrod Parker listing here. This trade is yet to be analyzed to the fullest extent, however when you add Cook with Parker, it is looking favorably for Oakland so far. Breslow was a waiver wire pick up for Beane off of Minnesota. He was traded by Arizona to Boston for Matt Albers. Cook is one of the better late inning relievers in all of Baseball. Bravo Mr. Beane. Sean Doolittle (26): Doolittle was drafted in the 1st round of the 2007 Amateur Entry Draft. Evan Scribner (27) Scribner was plucked off of waivers from the Padres at the end of the 2011 year. Jesse Chavez (29): This cost the organization nothing as they claimed the Canadian off of waivers from the Blue Jays. Jim Johnson (30): December 2, 2013: Traded by the Baltimore Orioles to the Oakland Athletics for a player to be named later and Jemile Weeks. The Oakland Athletics sent David Freitas (minors) (December 12, 2013) to the Baltimore Orioles to complete the trade. Jemile Weeks (27) 2B: Drafted by the Oakland Athletics in the 1st round (12th pick) of the 2008 amateur draft. David Freitas (25) C/1B: August 3, 2012: Traded to the Oakland Athletics for cash to the Washington Nationals and Kurt Suzuki. Kurt Suzuki (30) C: June 7, 2004: Drafted by the Oakland Athletics in the 2nd round of the 2004 amateur draft. 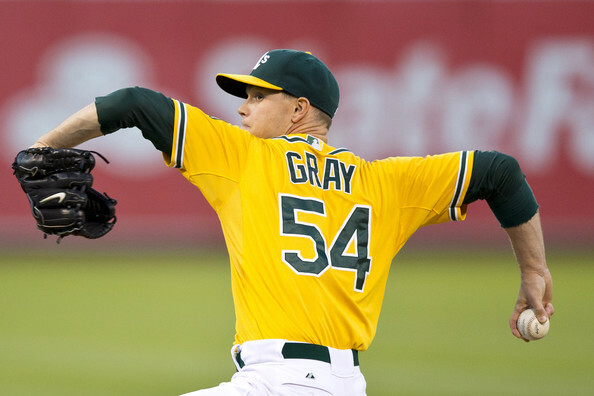 Sonny Gray’s importance to this A’s pitching rotation is even more relevant with Griffin and Parker out. So far in 3 outings, he has a 0.93 ERA in 19 IP. This carries his career numbers to a 7 – 2 record and a 2.28 ERA in 13 Game Starts. This 24 Year Old from Nashville TN, is making good on his 18th overall selection in the 2011 MLB Amateur Draft. Gray isn’t even Arbitration Eligible until 2017, and is only a Free Agent after the 2019 season. He will be in the Bay Area for many years to come. Posted on April 16, 2014, in MLB Roster Trees and tagged A.J cole, A.J. Griffin, aaron cunningam, adrian cardenas, AL West, andrew bailey, anthony gose, arizona diamnondbacks, barry zito, billy beane, blake treinen, brad peacock, brett anderson, brett wallace, carlos gonzalez, chad gaudin, chris carter, clayton mortensen, collin cowgill, connor robertson, corey wimberly, craig breslow, craig italiano, dan haren, Dan Otero, dana eveland, daric barton, David Freitas, derek norris, doug fister, drew pomeranz, eric patterson, evan scribner, fabian williamson, fernando abad, fernando rodriguez, geroge kottaras, gio gonzalez, greg smith, guillermo moscaso, houston astros, huston street, ian krol, jarrod parker, jed lowrie, Jefry Marte, jemile weeks, jesse chavez, jim johnson, joe blanton, john jaso, John Wooten, josh donaldson, josh outman, kevin kouzmanoff, kiki calero, kurt suzuki, luke gregerson, mark Mulder, matt holliday, matt murton, Max Stassi, michael taylor, Mike Morse, miles head, nick swisher, o.co coliseum, oakland athletics, raul alcantara, rich harden, robert gilliam, ryan cook, ryan kelly, ryan Sweeney, ryan webb, Sacramento River Cats (PCL), san diego padres, scott hairston, scott kazmir, sean doolittle, sean gallagher, seth smith, Shane Peterson, sonny gray, tim hudson, trevor cahill. Bookmark the permalink. 1 Comment.